The story of Kona coffee is a long one. Coffee has been grown in Kona for over 175 years. In earlier times, the community would pitch in to pick coffee at each individual farm when it became ripe. 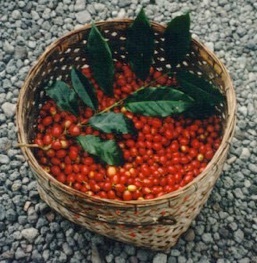 Since some coffee "cherry" (the soft, grape-sized fruit containing the coffee bean) inevitably fell to the ground, the keiki (children) would follow the grown-ups as they harvested, picking up the individual cherry from the ground with chop sticks. Schools used to have a harvest break to allow the keiki to help with the coffee harvest. 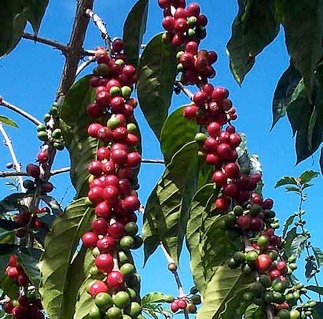 Nowadays, the schools no longer let the keiki out for coffee picking, and most farmers either harvest the cherry by hand themselves or hire professional coffee pickers. Our coffee picking season lasts from July or August to January or February and many farms are done in December. Only the ripe coffee is harvested - each red cherry is picked by hand, leaving behind the immature green fruit to ripen later in the season. It takes 220-250 cherries to make a pound of cherry, and it takes about 6 pounds of cherry to make one pound of roasted coffee. It is a labor-intensive method of farming, but one which brings out the best flavor of the coffee since the coffee cherries are picked at the pinnacle of ripeness. Most coffee cherry has two beans per cherry (type I bean). Each of these beans is flat on one side and rounded on the other. 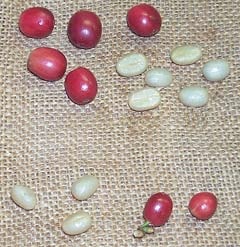 Peaberry coffee has only one rounded bean per cherry (type II bean). Peaberry is considered to be more flavorful than type 1 beans. Many farmers sort their coffee into various types of beans. 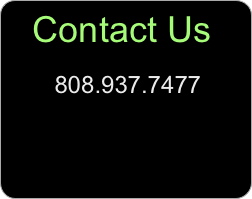 • Kona Extra Fancy: Type I beans - will not pass through a 19/64" round hole, and type II beans - will not pass through a 13/64" hole, with 10 or fewer defects. • Kona Fancy: Type I beans - will not pass through a 18/64" round hole, and type II beans - will not pass through a 12/64" hole, with 16 or fewer imperfections. • Kona No. 1: Type I beans - will not pass through a 16/64" round hole, and type type II Beans - will not pass through a 10/64" hole, with 20 or fewer defects. 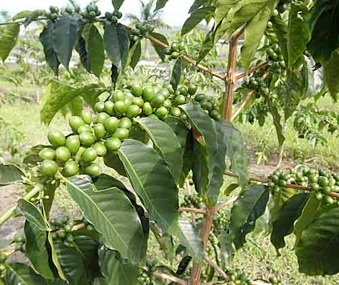 • Kona Prime: May contain type I and type II beans of any size, with 15% or less defective beans by weight and no more than 5% sour or black beans. Type I beans (shown at the top) are the more common with two beans per cherry. Type II (peaberry) beans have only one bean per cherry (shown at the bottom).